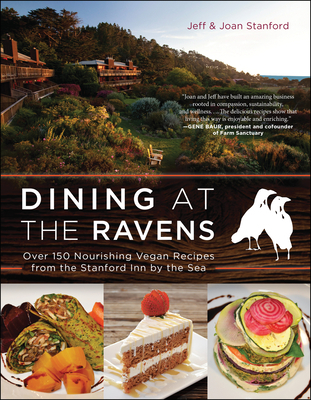 At The Ravens, dinner is more than just a meal. It's a feast for your spirit. Jeff and Joan Stanford came west to Carmel California to find careers in education, agreeing to help manage a small inn while looking for work. Jobs were scarce, the United States was in recession, and they found themselves enjoying their guests and rehabilitating the property they managed. Looking to the future, they chose to continue inn-keeping, and by 1980 they were in Mendocino starting a family. Joan ran the front, while Jeff remodeled the inn and created their certified organic farm on the site of what had been known as the China Gardens during Mendocino's logging era. The Inn allowed both of them to return to their former interests. Passionate about early education, Joan trained as a Montessori teacher which led her to discover the power of art to transform human experience. She enrolled in psychology at Sonoma State University and received an MA, specializing in Art Therapy. Today she is a registered art therapist, collagist, and educator. Jeff recognized that the "state of realization" that so many sought in the movement of the 1970s and 80s must come from a new relationship with life, beginning in the kitchen, where decisions affect the practitioner and the planet. He became vegetarian as a first step to honor all life, not only the lives of his family, friends, and pets. He and Joan sought to create an inn that sat softly upon the earth. They created one of the first "green" bed and breakfast inns without realizing they were doing so. Understanding that their Inn was a destination, Jeff and Joan wanted to provide the highest quality food to their guests, which Jeff began cooking in the early 1990s. The restaurant followed their philosophy serving a whole food, plant based dishes designed to rival the cuisine found at the highest rated restaurants in the San Francisco Bay Area. They discovered that many cooks can create great food, and they created a co-creative kitchen where all are invited to comment and tweak dishes. The final arbiter is Jeff, but the process is dynamic and assures that each person in the kitchen can express their creativity.